Please come out and join PugHearts for good pugs, good people, and GREAT food at On The Rox Bar and Grill on Saturday 4/1/2017 from 11am to 4pm. On The Rox will be doing a crawfish boil and graciously donating 10% of all food and drink sales to PugHearts! 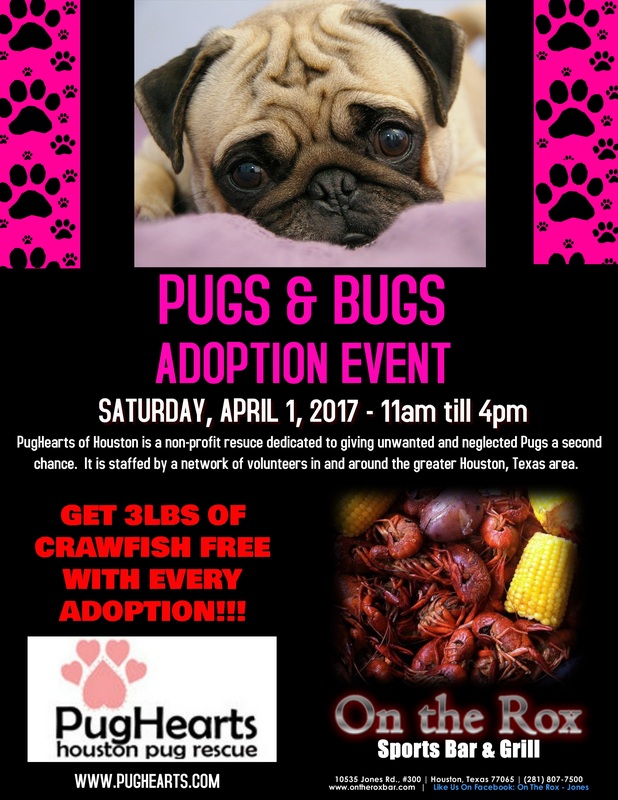 PLUS anyone fully adopting a pug at the event will get 3 pounds of crawfish FREE! YOU CAN'T BEAT THAT! This is an adoption event as well as a crawfish boil fundraiser, so plan to bring fosters to be adopted! Please note, this is an outdoor event and the dogs are not allowed in the bar and grill. After the parade we will be going over to Floppy Pets in Galveston for an adoption event from 3pm to 5pm. So be sure to drop by and check our adoptable dogs! The pugs will out at Dog House Pet Salon for an indoor event on Saturday 1/28/17 from 11am to 4pm. Please bring out your foster dogs and personal pets to enjoy this Galleria area venue. PugHearts will be kicking off our 2017 adoption events at Rover Oaks Pet Resort on Saturday 1/21/17 from 4:30pm to 7:30pm. I hope everyone will come out and make 2017 and this event a huge success! PugHearts will be having its final adoption event for 2016 at the new location for Gimmie a Bark in Friendswood on Sunday 12/4/16 from 1pm to 4pm. This is a must attend event as there will be a festive atmosphere and Santa Photos for the pups going on! A big thank you to Wendy Franty who will once again be volunteering her time to make the Santa photos a success!!! The cost of Santa photos will be $10 for a single dog or $15 for multiple dogs (please pay with cash or check). Photos will be posted within a week so everyone can show them off on their Christmas cards!